SC has stayed the February 19 state cabinet decision to set free the seven convicts and posted the matter to March 26 for further hearing. Jethmalani on Saturday defended the Jayalalithaa government’s decision to release all the seven convicts serving life term in the Rajiv Gandhi assassination case. Senior Supreme Court advocate Ram Jethmalani on Saturday defended the Jayalalithaa government’s decision to release all the seven convicts serving life term in the Rajiv Gandhi assassination case in the wake of Supreme Court’s order to commute death penalty of three of them. 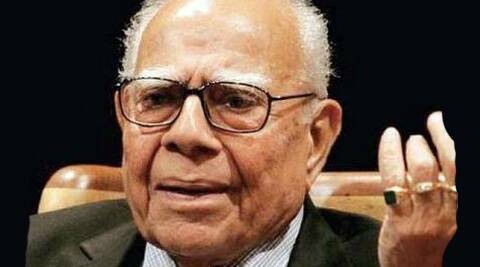 Jethmalani, who appeared for the three convicts Santhan, Murugan and Perarivalan in their plea for commutation of death sentence, said the state government was well within its limit to decide on their release. “It is the state’s Governor who pardoned Nalini, one of convicts and commuted her death sentence to life sentence”, Jethmalani said at a felicitation programme organised by MDMK for arguing the case. He hoped that Jayalalithaa would keep her decision and release them. The Supreme Court has stayed the February 19 state cabinet decision to set free the seven convicts and posted the matter to March 26 for further hearing.